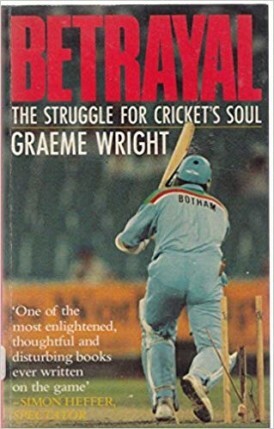 It was with considerable surprise, when I first took this book from the shelf, and looked on Cricket Web to see what our reviewer thought of it, that I found there was no such review – not least because I remember it causing something of a stir on its publication twenty-five years ago. That in itself should have come as no surprise, for the writer was a Wisden editor of recent tenure – 1986 to 1992 – and one who had become known, celebrated even, for his outspoken comments on the modern game. Graeme Wright, a UK-based New Zealander, would return for two more years at the helm of sport’s most famous annual, but it may be that this was a book he felt he could not have written while in the chair, so to speak. And it was one that I delayed reading for a number of weeks – having picked it up for less than a quarter of its original retail price, it regarded me somewhat balefully from the bookshelf while I demurred with magazines and papers. After all the title hardly promised an uplifting read. Yet it was a book that I enjoyed somewhat more than I was expecting to. I feared a rather worthy, or doom-mongering work – but it is written with a sense of humour, and namechecks some writers and thinkers you don’t often encounter in a cricket book – Machiavelli and Goethe, Pinter and Seneca. Furthermore, many of the writer’s grimmest prophecies have not come to pass. Wright picks up the story in 1963, a notable year in English cricket of course. The abolition of the distinction between amateur and professionals (henceforth, all players were to be known as ‘cricketers’) came in the same year as the new one-day domestic competition which we came to know as the Gillette Cup, and then the Natwest Trophy. In discussing these themes Wright makes some interesting observations on the reluctance of the modern game to cater for the part-timer – a talent such as Phil Edmonds lost to the game in consequence. From then on he goes on to look at the many issues and controversies which would envelop cricket, and English cricket in particular, in the ensuing thirty years. World Series Cricket, the rebel tours, ball-tampering and throwing, Close at Edgbaston, pitches, over-rates, the often uneasy relationship between England and Pakistan. The current England captain at the time of publication, Graham Gooch, gets a chapter to himself – a solid and yet complicated individual, rebel turned inspirational (to some) leader. His role in the notorious omission of David Gower from the 1992 Indian tour party is examined. I found only two factual errors: Sir Alec Douglas-Home did not fight two general elections against Harold Wilson (in 1966, Edward Heath was the leader of the opposition), and he also states that England did not select any Packer players in the summer of 1977. In fact all five were picked, although Bob Woolmer and Dennis Amiss only signed during the Ashes series, Amiss after he’d lost his place to Boycott (and there’s also plenty about him, little of it favourable). I finished the book still unsure of whom or what the writer felt had been betrayed, but perhaps that’s not important. He talks a lot about the relationship between the TCCB, ICC and MCC, and how the money men took over the game from the men with three initials. “Overall self-interest will prevail, which is why the struggle for cricket’s soul is a struggle being lost.” He was writing ten years before the advent of Twenty20, with its many attendant horrors for the traditionalist. But twenty-five years on this is an absorbing read, if somewhat needlessly pessimistic in places. This week Martin reviews a new biography of Maurice Tate, published more than half a century after his death, and four decades after the last one.